Cherylea Motel is situated in Blenheim, boasted to be the sunniest town in New Zealand.We are a short walk to beautiful park and Taylor River Reserve and the local restaurants are close by. Hosts Peter and Shona Etheredge welcome you to Colonial Motel. The motel complex has 3 studios, 2 one bedroom and 4 two bedroom units as well as a three bedroom unit, which is ideal for groups or larger families. Ideal for stays of two, three or more days, Brydan on Rose, with its semi-rural outlook in the heart of Marlborough's wine country, offers visitors spacious accommodation of the highest standard and comfort. The Panorama Motel is a 22-unit complex comprising of a mixture of studio, 1-bedroom and 2-bedroom ensuite smokefree units. Each unit opens out onto either a patio area with outdoor seating or onto its own private balcony. The Bay Vista Waterfront Motel offers quality accommodation in a unique waterfront location in Waikawa Bay, Picton. Only a 5 minute drive from the Picton/Wellington ferry terminal and Picton town centre, we have the ideal accommodation for your Picton and Marlborough Sounds holiday or stop over. 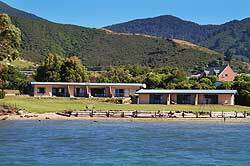 Our Picton based accommodation includes one and two bedroom motel units, as well as two, three and four bedroom holiday apartments providing an excellent base while you explore the magnificent Marlborough Sounds or walk the Queen Charlotte Track. This superb Blenheim Accommodation has 15 rooms and the property is located within walking distance to many great cafe and restaurants. Lugano Motor Lodge is the closest Blenheim motel to the Marlborough convention centre and The Clubs of Marlborough. The motel is ideal for busy corporate, families and guests wanting to enjoy a few days in Blenheim. Woodbourne Tavern & Motel is situated to enjoy the best of Marlborough; located in the quiet town of Renwick, just minutes from Marlborough's famous vineyards. Six spacious, luxurious double units. Three spacious studio units. Sleeping up to 6 people per unit and featuring super king beds. All units fully equipped, with laundry facilities available. A room with a view - enjoy relaxing on your own private balcony with a magnificent view of the beautiful Queen Charlotte Sound. Broadway Motel has eighteen fully self-contained units with laundry facilities and off street parking. The range of accommodation includes eighteen top of the range units (including two disabled-friendly units). Glenda and Andy extend a warm welcome and invite you to drive on in, relax and enjoy your stay with us. Aston Court Motel features near new units that are within easy walking distance to Blenheim town centre and perfectly situated as a base for making day trips around the beautiful Marlborough province. Superior units, serviced daily, access facilities, non smoking units available, spa suites, luxury executive/honeymoon suite. Fully equipped kitchen, Opposite shopping centre. 150m to restaurant, meals delivered with charge back facility. Blenheim Spa Motor Lodge is a new superior facility offering modern self-contained accommodation in the Sun Soaked region of Marlborough. Blenheim Spa Motor Lodge features 10 sophisticated units to choose from, seven of which include spa baths. Spacious self catering units that provide accommodation to suit a variety of budgets, great base to explore the fascinating area of Reefton. Indulge yourself in our luxury rooms. Enjoy the sounds of the sea from your balcony and delight at the breathtaking views. Whether you are looking for a quiet weekend away, family holiday or just bed and breakfast, Middle Park will fulfill your needs. Welcome to Blenheim, the heart of Marlborough. Centre Court motel is a new, centrally situated complex of 12 ground floor units. We are ideally situated for business or pleasure and it is just a short stroll to shops, restaurants and cafes. We are only 500 metres from the centre of town, offering budget accommodation with excellent quality, newly renovated furnishings. Jon and Eileen welcome you to Ashleigh Court Motel, a lovely spacious motel accommodation complex centrally located in beautiful, sunny Blenheim. The complex has 12 modern ground floor level units, a spacious studio, and 1 and 2 bedroom units. For the security conscious traveller, car parking is right outside the unit door. We also have units with Wireless Internet access. For the best in Picton, come to Jasmin Court for quality self-contained accommodation. We have a "Qualmark" 5-star studio rating, and one and two bedroom units with emphasis on quality, comfort and cleanliness.